Time Decay - What Does It Mean? What is the definition of the term "time decay" as it applies to the world of options? 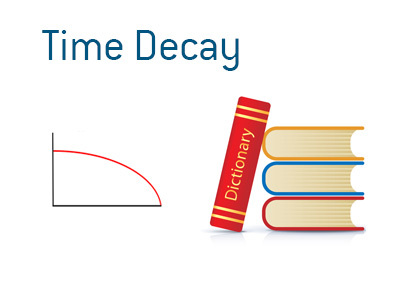 What is meant by "time decay"? There are a number of variables that ultimately create the final price that an option is priced at, including intrinsic value, volatility and time. With each passing day, the value of time in an option will degrade. For instance, all other things being equal, an option will be worth less on August 21st than it will on August 20th. This is called "time decay". "Time decay" is the reason why selling premium is so tempting, as an options seller is making money for each day that passes, provided that there is no increase in intrinsic value or volatility. For instance, let's say that you decide to sell a GPRO 20 put at $1.50 with the stock currently trading at $23. The option is set to expire in 3 weeks. Let's assume, for the sake of this definition, that GPRO trades at exactly $23 from the time that the option is sold until its expiration date. Over the course of this three week period, the value of the option will drop every day thanks to the decay of time value that is taking place. By the time that the option has expired, the seller will have pocketed the entire $1.50 premium, as the option will end up expiring worthless. "Time decay" is also referred to as "Theta".